"the sun no longer shone with the whiteness of its prime, but was dim and tarnished as if with a vapor of blood. New stars without number had declared themselves in the heavens, and the shadows of the infinite had drawn closer. And out of the shadows, the older gods had returned to man…. And the elder demons had also returned, battering on the fumes of evil sacrifices, and fostering again the primordial sorceries." 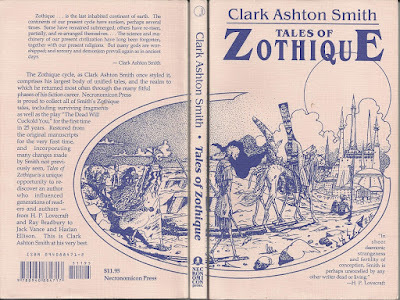 The Zothique stories are some of my favorite Clark Ashton Smith pieces that I've read over the years. The dead outnumber the living & adventurers are not as much in evidence. Yet I keep finding myself wondering if there are connections between the demonic planar scum that feed on the bones of the Earth during the time of Zothique & the alien entities of C.L. 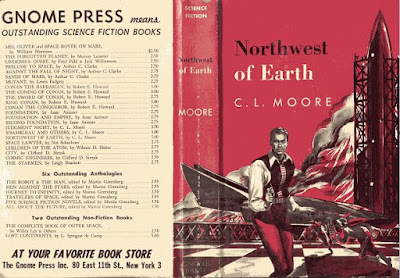 Moore's North West Smith space stories. Yet somehow I'm left with the gut feeling that 'Zothique' exists as an alternative Earth location or adjunct location to Hyperborea within my own 'Old Solar System' campaign. If Hyperborea is waning under the Hellish eye of Cykranosh ( Saturn ) then Zothique is one step away in another dimension or an alternative time line. Smith tells his tales with a gusto of vocabulary & vividness of a fever dream that takes the reader on a delirious journey into his far future world. I'm often left feeling that there's far more going on below the surface of these tales, the irony & cruelty is both enticing & frustrating. I've written about Io being perhaps the Hyperboreans weapons testing facility within my home campaign. The dread sorcerer Namirrha of the story "The Dark Eidolon" is exactly the sort of wizard that might be socializing with the sorcerers & wizards of Jack Vance's Dying Earth series. Completed December 1932. 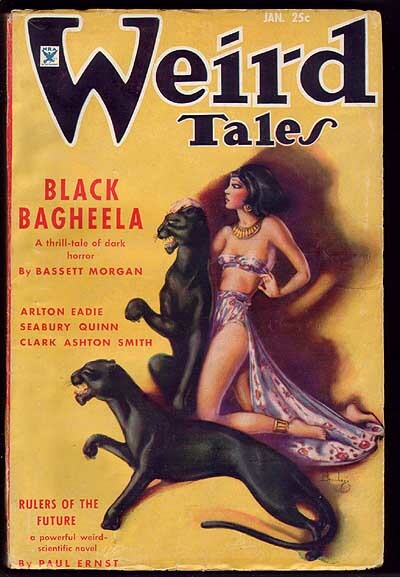 First published in Weird Tales, January 1935. Yet I mentioned C.L. Moore's North West Smith at the beginning of this blog post. So what does he have to do with this? Well, many of the pseudo demonic horrors that Moore's hero fights might be far more at home in Zothique then simply the planets of the solar system. Everything in these stories goes in cycles including mankind's ascend & extinction. Death & entropy are central themes laced with irony within the Zothique cycle. This same theme plays itself out within C.L. 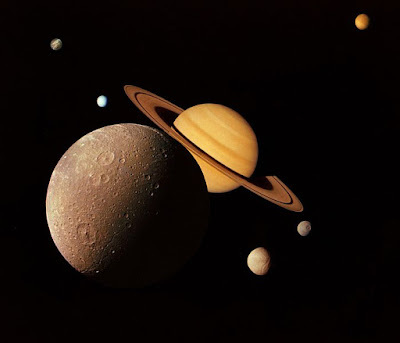 Moore's & Leigh Brackett's solar system stories. Zothique is one of the most dangerous places in the multiverse because of the excursions of 'otherness' from the 'Outer Blackness'. Wizards have been empire building for countless centuries here. So could the central government of 'Old Earth' (is there such a thing as its only two minutes to midnight when the 'Stars Come Right'?) know about Zothique? Not only do they, there's possibly a twenty to fifty thousand gold piece reward for such artifacts from the crypts & vaults of the setting. Because of monsters such as the ones found in CAS's 'Weaver In The Vault' & 'The Tomb Spawn' we are left with the feeling that very few with collect such a reward. The noses of the Leigh Brackett's Terran Exploitations Company & the Earth government or Terran authorities are going to be investigating any artifacts & relics by 'top men' in their fields. 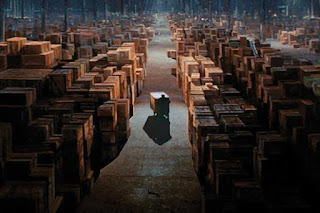 After which all of these artifacts are going to be consigned to a secret warehouse some place. We know that Hyperborea of Astonishing Swordsmen & Sorcerers of Hyperborea second edition fame is the far future of an Earth. But could there have been a Hyperborean people on Zothique which experienced the Silver Death? The answer is a resounding yes! Ulua, the daughter of the king of Tasuun, from The Witchcraft Of Ulua By CAS is one whose description perfectly fits a Hyperborean sorceress of the highest orders & they are not someone to be trifled with. "During his first month in Miraab, Amalzain heard much of the Princess Ulua, sole daughter of Famorgh and Queen Lunalia; but since the women of the royal family seldom attended the banquets or appeared in public, he did not see her. The huge and shadowy palace, however, was filled with whispers concerning her amours. Ulua, he was told, had inherited the sorceries of her mother Lunalia, whose dark, luxurious beauty, so often sung by bewitched poets, was now fallen to a haggish decrepitude. The lovers of Ulua were innumerable, and she often procured their passion or insured their fidelity by other charms than those of her person. Though little taller than a child, she was exquisitely formed and endowed with the loveliness of some female demon that might haunt the slumbers of youth. She was feared by many and her ill will was deemed a dangerous thing. Famorgh, no less blind to her sins and witcheries than he had been to those of Lunalia, indulged her in all ways and denied her nothing." So perhaps the 'Silver Death' caused the 'Hyperboreans' of Zothique to build vast vaults just as they had in Hyperborea. And those vaults became their tombs. There are thousands of undead or worse waiting below the sands of Zothique. But could the 'Silver Death' or 'Green Death' have been a milady of the soul rather then simply one of the flesh? 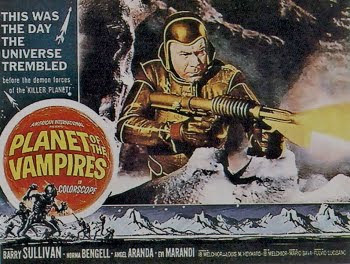 There are eerie parallels with the movie 1985 film Life Force with its alien space vampires. The comet swings around Earth depositing the 'Silver Death' plague upon on the city of Yoros as well as perhaps Hyperborea. 'The Derelict' from '85's film Life Force. The setting works on its own and has a richly detailed setting primed & perfect for an old school Sword & Sorcery campaign. There are literally thousands of potential dungeon & adventure locations. Perfect as destination for Astonishing Swordsmen & Sorcerers of Hyperborea second edition's higher PC levels. There are plenty of chances for necrotic adventures with high level undead such as liches, vampires, and more. 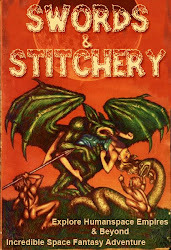 Demons, demons, demons, the setting is rife with extraplanar demons. Perfect store house for foul and degenerate magicks of all types. Locations are alien enough to be molded into adventure settings for popular AD&D first edition or B/X D&D adventure modules. The weird & strange seem right around the corner. A world setting with a definitely history with lots of holes perfect for the DM to squeeze in their own DYI D&D creations with lots of epochs of undefined time periods & empires. 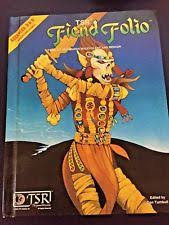 The perfect setting for all of those crazy Fiend Folio Advanced Dungeons & Dragons first edition monsters.